You probably recognize the loud buzz a ringing mobile phone often causes in nearby speakers. But where does it come from? Let's dissect the sound and see if it reveals something about the call! First we need to know a little about how GSM works. A certain cell site (tower) is responsible for handling all the calls made in its coverage area. But the allocated frequency band is very limited. Several phones can talk to the same tower on the same frequency by taking turns. Thus, one GSM phone will only transmit a short burst of digitally encoded speech at a time, and will then wait silently for its next turn. This is called time-division multiple access (TDMA). Up to 8 phones can fit on a single frequency. They take turns during what's called a TDMA frame. One phone may only transmit once every frame, in its own allocated time slot. One frame lasts 0.004615 seconds, a time slot thus being one eighth of this. Now, let's zoom into the buzzing sound. 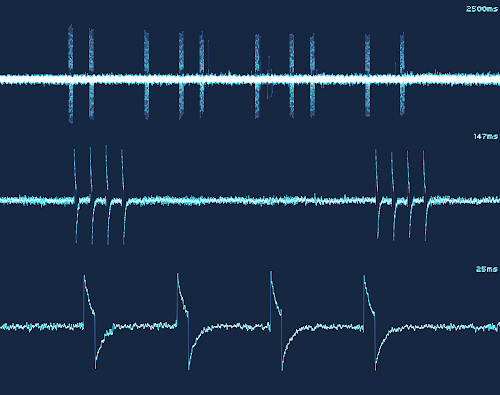 Plotted below is its waveform. 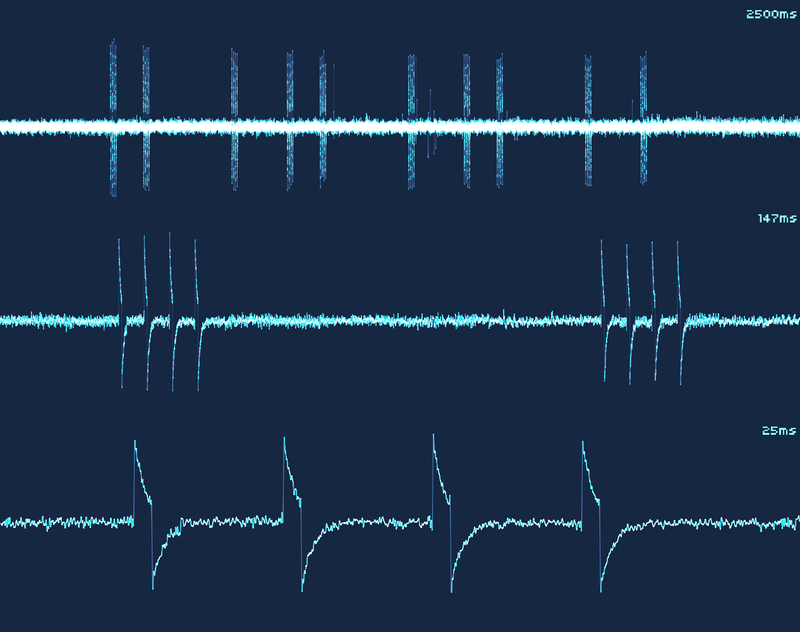 Not surprisingly, it is also a plot of the voltage variation in the speaker cable. So, what does this reveal about the call going through? Nothing whatsoever, luckily. 1/0.004615 means the pulses have a 216Hz base frequency, right where loudspeakers and human hearing will pick it up. What's odd is that the pattern or rhythm is the same or similar every time I've heard this, why is that? It seems as if these bursts fit a certain time pattern of a couple of seconds. - The burst depicted above are control channel bursts, called SDCCH. They're grouped by 4 because one layer 2 packet is divided in 4 bursts transmitted on 4 consecutive L1 frames. They are very periodic because one logical channel is composed of 1 group of 4 bursts every 51 frame (the main SDCCH/8 channel) + 1 additional group of 4 bursts every 102 frames (the SACCH/8). 51 frame period ~ 1/4 s, 102 frame period = 1/2 s.
- Before those even appear, there will be some RACH bursts a couple seconds appart. Theses are the firsts burts sent to request the control channel to the BTS. - After the SDCCH bursts, you'll get TCH bursts which are much more dense, occupying an entire physical channel. However at that point the power control loop will have kicked in and reduced the TX power to the minimum acceptable to maintain signal quality (to save battery). And additionally on TCH, when the phone has nothing to "say" (i..e no control message, nor any voice to transmit), it doesn't transmit at all. Both contribute to the impression that the "buzz" is stronger at the start of a call. It most likely has to do with some sort of keep-alive or concurrent data connection between the UE (mobile) and cell tower. This recording was taken when the phone was idle. If it was in a call, the interference would be constant (at least to the human ear). Actually, I find it is transmission that causes this - I used to have a 5.1 system that loved to pick up these noises. The buzz always preceded me getting a text, or after I hit the button to send - I managed to impress a few people by picking up the phone just before I got a text. More fun was when it was sending/receiving data (e.g. an image message) - that was a long, continual buzz, rather than the 1-2 set of buzzes. Note that actually, it's generally not the RF coupling onto the speaker that's causing the noise - that would be waaay to quiet to hear. It's usually the RF energy being rectified by the ESD diodes in the amplifier, upsetting the feedback, and being amplified by the amplifier. Solution is generally to add 27pF 0402 caps (the exact size is important due to the SRF) close to the amp. Ferrite beads can't hurt either. Thanks! You're correct. To be accurate, I made this recording by holding a phone next to a dynamic microphone, and then preamplifying that to line level. Actually I'm pretty sure it's not even the RF at all (not directly), but more the brutal change in current when enabling/disabling the PA at each burst. I would imagine you either move the phone further away from the speakers upon answering, or the phone adjusts its transmit power to the lowest workable value to save battery. The buzz doesn't really disappear. Power levels may change but usually not enough to cut the buzz. Moving the phone while answering, even by just an inch, may reduce the induced current enough that it isn't really audible anymore. The interesting thing is that, to conserve power, silence isn't transmitted on the radio interface. Instead, the cellular network generates so-called "comfort noise" (to assure the other end of the call that the connection is still open). When transmitting (i.e. when you speak on your mobile), the RFI noise is a continuous buzz, when quiet, the signaling pattern is a rythmical *TAtatataTAtatata*. I have a Philips GoGear MP3 player. When it is near a phone and the GSM buzz goes off, the player volume is always reset to zero. Happened with 2 phones now. The MP3 is usually connected to the car radio to play. The phone typically initiates transmissions at max power and then negotiates the ideal power for the transmission to work and save battery. That's why you typically only hear it at the beginning of the calls. The phone also sends periodically a Location Update (as far as I recall @max power as well) message to let the network know that it is up and alive. If the network does not receive this location update it will assume the phone ran out of battery and it can save resources by for instance, sending the calls straight to voicemail instead of using scarce spectrum paging the phone for it to ring.